Companies of all sizes are looking for their IT department to deliver virtualisation solutions as a service. VMware vCloud allows IT administrators to leverage existing VMware technologies to build public or private clouds. 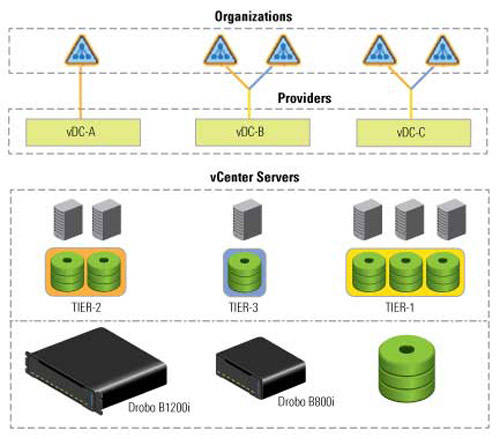 vCloud provides a way to pool IT resources on-demand as self-managed virtual infrastructures. But to get to the cloud, new and existing resources must be easier to provision, manage, and monitor. Although VMware vCloud Director is a technology that was first used by service providers, it can be used in any sized organisation to raise service levels and lower costs. Drobo provides the easy-to-use storage component with a price structure enabling SMB IT to deploy tier 2 or 3 storage beside enterprise-class, top-tier storage. This document describes using Drobo with vCloud and assumes that the Drobo has been deployed and configured within the VMware virtualisation infrastructure (ESX/ESXi and vCenter). For more information on using Drobo with VMware, refer to the VMware How-To document "Deploy VMware and Drobo as a Complete and Cost-Effective Virtualisation Solution" in the How-To Guides section on www.drobo.com/resources. For most users, particularly larger ones, Drobo devices are cost effective and match the profile for backup or lower-tier primary storage. Drobo model B800i supports SATA drives for the best price capacity but not optimised for IOPS. Drobo model B1200i supports SATA and SAS drives, as well as SSDs for a mixture of price/capacity and price/performance. By combining a small number of SSDs with high-capacity SAS drives, users can have Tier 2 storage that is high capacity and strong IOPS that otherwise would require a large number of high-speed SAS drives to achieve. NOTE: Drobo does not provide an IOPS profile at an enterprise SSD level in the >10,000 IOPS range. For those Tier 1 requirements in larger organisations, enterprise tiering solutions or all-SSD storage would be required.